Milton Wagner was born February 20, 1963 in Camden. Milt grew up playing ball against and with Billy Thompson and Kevin Walls. The three joined forces on Clarence Turner’s Camden High School team. Milt was a year ahead of Billy, who was a year ahead of Kevin. All three had learned the game from older Camden legends, like Fly Thompson and Ben Hill. Milt was a fearless leader in high school, who saved his best games for marquee matchups. 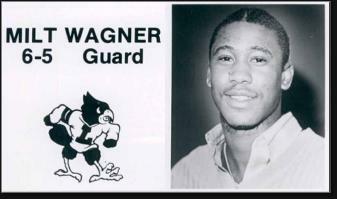 He dropped 42 on Adrian Branch and DeMatha High, and 52 on Pearl Washington’s Boys & Girls. In 1979, he led the Golden Panthers to the state title. Two years later, he was named a McDonald’s All-American. As a 6’5” guard, Milt was on the radar of virtually every major college program in the country. He decided the right program was Denny Crum’s Louisville Cardinals. He liked their fast pace and loved how deep they went in the NCAA Tournament almost every year. He also knew there was no pro team in the state, so attention-wise, playing for Louisville and Kentucky was like playing in the NBA. Milt played his first varsity season in 1981–82, playing 10 to 15 minutes a game. As a sophomore, he teamed with Rodney and Scooter McCray, Lancaster Gordon and Thompson to lead the Cardinals to the Final Four. They lost in the national semifinal to the University of Houston. A broken foot led Milt to red-shirt for the 1984–85 season, and Louisville missed the NCAA Tournament for the first time in nearly a decade. Milt returned for his senior year in 1985–86 and teamed with Thompson and freshman center Purvis Ellison to win the national championship. Milt score nine points in the championship game, a 72–69 victory over Duke. For his college career, Milt scored 1,836 points, at the time second-most in Louisville history. He averaged 12.8 a game and was All-Metro Conference in each of his three seasons as a starter. The Cardinals went 113–32 when he was on the team. The Dallas Mavericks took Milt in the second round of the 1986 NBA Draft, but he failed to make the team and was waived that October. He caught on as a reserve the following season with the Lakers and played 40 games behind Michael Cooper and Byron Scott. He got into five playoff games that spring as the Lakers rolled to an NBA Championship. Although Milt was just a minor contributor, he became one of the few players to win high school, college and pro championships. Milt returned to the NBA in 1990 as a member of the Miami Heat. He played in 13 games before his release that December, ending his NBA career. He also played in the CBA, and for pro teams in Israel in Europe for nearly a decade during a 13-year pro career. In 2000, he began his coaching career at the University of Memphis, joining the Tigers’ staff as an assistant and helping the school win the NIT in 2002. He was later appointed Coordinator of Basketball Operations. Milt moved to UTEP in 2006 and then to Auburn in 2010, moving with coach Tony Barbee at each stop as his trusted assistant.